Food, games, and love in Bilgewater. Plus, hybrid champ scaling & how pro players impact balance. We’re deep into the Curse of the Drowned event, so this week we turn our eyes to Bilgewater. Then afterwards, let’s talk a bit about hybrid champion scaling and pro players’ impact on balance. What do people eat in Bilgewater? The most common foods would be what you’d expect on an archipelago like the Blue Flame Isles—fruit, fish, that sort of thing. They’d import stuff from the mainland too, since there’s no real open space for farmland like in Demacia or Ionia. Does GP still love Illaoi? Yes. But he’s bitter about it. What kinds of games do they play in Bilgewater? TL;DR, risky and dangerous ones! 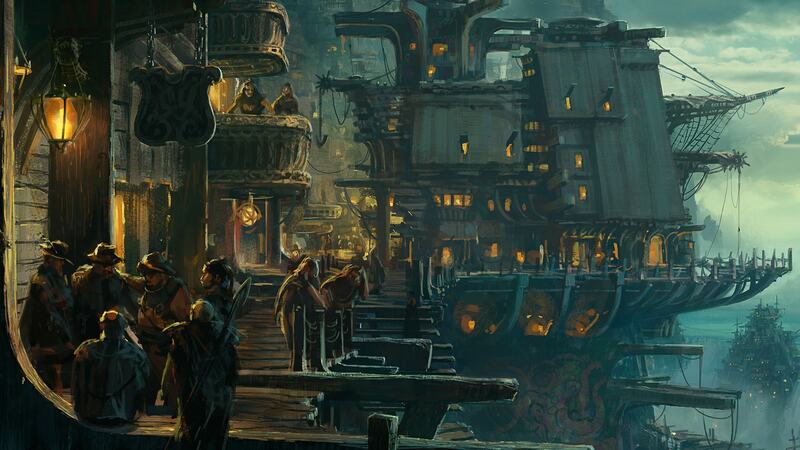 There are plenty of seedy gambling dens in Bilgewater, where fortunes are made and lost on a daily basis. Cards, dice, and bones are commonly played, generally for high stakes (and with lots of cheating!) but more exotic games, maybe involving knives, blood, loaded pistols, and/or sea serpents, are easily located, if you know the right people and willing to pay. It’s understood that the indigenous people of the Blue Flame Isles have their own games, which can last for days on end and involve feats of skill, endurance and strength, but the complex rules and rituals around them are all-but impenetrable to outsiders (possibly intentionally… ). Why do some champions have ad or ap ratios on their abilities when the majority of their kit is primarily geared towards supporting builds for the other damage type? At a high level, this is working towards the goal of allowing champions to explore different build types and playstyles. In practice, I think there are two applications of this commonly seen in game. Purposeful alternative builds: This is where we expect that only a small push—like a single ratio or effect—can support an entire alternate build. I personally really like this type of alt build because, by its nature, the champion’s kit is going to behave very differently from the core build. A good example here is Kennen, who has a single AD ratio on his W passive, but that’s all it really takes to make AD Kennen a viable alternative to AP. Interesting possibilities: This is where we use an opportunity on an ability that we don’t want to scale with the main build path. Throwing in a little “off-build spice” can create future or just fun possibilities, even if it won’t typically create a serious off-build. Times where these builds have come up in the past is when a champion builds hybrid items (like old Triforce), or when a team comp is so stacked in one damage type that it becomes increasingly useful to have some mixed damage at almost any cost. An example here is Ashe’s R AP ratio: We don’t really want Ashe’s ult scaling into a big damage nuke with AP, but it creates some small breadcrumbs for hybrid builds, or maybe even something crazy, like a Nashor’s Tooth AP build. Do you ask pro-players’ opinion before you nerf a champion? Individual champion nerfs? Typically no. For the 10 ban system, we sent a paper-prototype of the proposed system to pro orgs around the world. We also had the NA LCS teams come to the Riot campus over the weekend after their matches to run “mock drafts” against each other and discuss the format. Huni (then on Immortals) was especially engaged and insightful to listen to as he mapped out mock drafts in the system based on different metas with different power-picks. We don’t typically ask for pro input on smaller patch-to-patch changes. However when making changes to address pro play in particular, we sometimes send out a changelist to pro organizations globally. We’re planning on working with the orgs more in the future, but one of the challenges is that pro players are constantly practicing and focussing on the current state of the game and it’s hard for them to take time and think about upcoming changes (some that might not even make it to Live). We’re looking to expand our feedback loop to coaches, analysts, and support staff of the pro orgs in the future, and working with the pros is always a valuable (and growing) opportunity for us.